Accidents interrupt lives. Not just yours, but those who rely on you. The stress from dealing with ordinary life plus coping with injuries as well as doctor visits and recuperation can be overwhelming. Added to this is the fact that you will likely have to deal with an insurance company adjuster, whose job in part is to pay out as little as possible on a claim, in order to recover the compensation you need to rebuild your life. In Florida, injury victims are free to deal with an insurance company after an accident without hiring an attorney. This works for some accident victims. And as a public service for those victims, we provide online resources to help them negotiate directly with the insurance company handling their accident claim. We are happy to do so. For instance, read our post: How Do You Know If Your Settlement Offer From the Insurance Company is Fair? Have You Considered All of The Factors Involved in a Florida Damages Claim? For those who have been injured and have decided to try and settle their injury claim with an insurance adjuster without a lawyer, then this article should be helpful to you. Why? With our many years of experience dealing with clients and Florida insurance companies and their adjusters, we know that things can get frustrating very fast for an accident victim. Indeed, we know that all too often, the insurance adjuster will try to take advantage of an unrepresented victim in settlement negotiations. So, we are providing this support for those injury victims who want to go at it alone – someone we know that is already having to deal with so much in the aftermath of their accident and doesn’t deserve to be mistreated by the insurance bureaucracy. 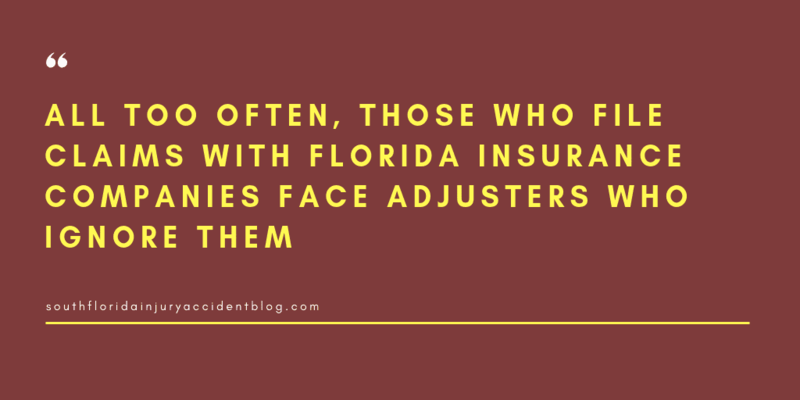 All too often, those who file claims with Florida insurance companies face adjusters who ignore them. Phone calls are not returned. Questions are not answered. Paperwork is lost. Low ball offers are sent that are insultingly small. The information below is intended to give insight and assistance to those who are working with an insurance company and are finding it difficult to get anywhere. Note: our resources are providing general information but cannot and should not be read to substitute for advice of counsel. We’re not creating an attorney-client relationship. Our goal is to share what we know about Florida personal injury law and to help injured victims gain an understanding of how Florida’s accident laws work and how a victim can settle their claim with less frustration and delay. We don’t like it when someone abuses their power and tries to take advantage of someone simply because the victim has less information than the abusing party. Insurance companies are in the business of selling policies to business and individuals to cover their losses in the event they cause an accident. The United States insurance industry is the largest in the world. The Department of Transportation considers the American insurance industry to be “vital” to our nation’s economy, with revenues each year exceeding $1,000,000,000,000.00 (One Trillion Dollars). This means insurance companies are in the business of making money — and they are very, very good at it. For you, the accident victim, understanding how sophisticated insurance companies are, despite they homey and personal advertising campaigns, is extremely important. Why? Because your injury claim, as well as all other accident claims, are threats to their bottom line. The less money that is paid in claims, the more that is kept in the company coffers. If you are negotiating with the insurance company, then you need to know their viewpoint. It’s business to them no matter how caring and concerned they appear in any communications with you. See, Top 10 Reasons Why Insurance Companies Don’t Pay Car Accident Claims. What does your insurance company have to do once you tell them you were in a car accident? Sometimes, they are “independent adjusters.” They are employees of a separate insurance adjuster company. Independent adjusters are used, as a general rule, when the insurance company does not have a field office in your location or town. Then there are “public adjusters.” These are adjusters that work for the policyholder. They are an employee of the business or company that paid the insurance premiums and is responsible for your accident. Their job is always the same, whether they are “in house” or independent or public: to settle the accident’s claim for as little as possible. See, “Florida Insurance Adjusters Work Hard to Keep Car Accident Claims Payment As Low as Possible. Beware of the Denied Claim, the Low Ball Claim and the Recorded Statement. If you are negotiating your claim with the insurance company, then you will be dealing with their adjuster. Be ready. The adjuster is a trained professional, with past experience dealing with countless claims that are similar to your own. He or she will be well educated in how to investigate the accident itself, too. Adjusters are expected to keep up with industry continuing education courses in their areas of expertise. The adjuster will be responsible for investigating your accident as well as documenting his investigation. He or she will make their own determination of what has happened and report it to their employer. It will be with their approval that you will receive a settlement offer. And it will be with this adjuster that you will negotiate that offer and settle your claim (unless you choose to file a lawsuit against the person who caused your injuries). Settling most accident claims will involve (1) the adjuster asking you for a recorded statement and (2) a release of your medical records as part of the investigation. He or she will want the name of your doctor (or doctors), too. A claim number will be assigned to your case. You’ll get letters that confirm things, like you have been contacted and that you’ve reported a claim to the company. That’s so the insurance company can document that they are doing things – it’s not to comfort you or help ease your anxiety. You will have the responsibility of preparing your own “demand” with documentation to support your claim for damages. You will need to organize documentation that includes medical records, prescription drug receipts, hospital invoices, lost wages evidence, and things like car repair invoices. This is an ongoing job. As you incur more medical bills and doctor visits and as you are not able to work, then you will have to keep supplementing your demand documentation. The adjuster will not respect nor pay for any demand that is not properly supported in your documentation. How much should you ask for in your demand? It will depend upon your individual situation. Should you make a demand while you are still treating your injuries? Should you have surgery before making a demand? Should you ask for three times your total medical expenses and lost wages? Five times? Ten times? You will have to decide what is reasonable and fair in your case. Your formal written presentation of your accident claim to the insurance company will begin with a “demand letter.” This is not just a letter you write to the insurance company. It is a cover letter with details of your claim, together with supporting documentation. What Happens When You Make a “Demand for Damages and Compensation” in a Florida Car Accident Case? How do I write a demand letter for personal injury without hiring a lawyer? Your accident claim must be supported by facts and evidence that confirms that what you are demanding is reasonable and fair under the circumstances. If you are negotiating for yourself, then you have the task of gathering all the proof needed for every part of your insurance claim. This is a big job. How so? First, this will include providing documentation of how and why the accident occurred (liability and fault). You must show that the insured is liable and responsible for what happened to you. Second, It will also include giving evidence of past, present, and future costs and expenses (damages). You have to prove documentation and support for your damages claim – the dollars and cents you are demanding be paid to you. Damages are defined in Florida law. What you can collect in an insurance claim may not be all your harm, not every loss is covered here. Damages that are covered include “compensatory damages.” These are things you have actual invoices for – doctor’s bills, the EMS charge, etc. Compensatory damages exist to “compensate” the victim for harm they have experienced. Some damages may be challenged; whiplash, for instance. Do not expect the insurance adjuster to want to cover a claim for whiplash without medical support. Even then, he or she may try and low ball that damage coverage, because adjusters are jaded and suspicious about whiplash claims. How can I prove that the store owner knew about the dangerous conditions that led to my slip and fall accident? Florida law defines what damages are covered in an accident claim. There are laws for what harm is covered by the insurance policy. Accident victims may be surprised to learn that not all harm is covered here. Both the insurance policy as well as Florida laws passed by the Florida legislature (and defined by Florida courts) will decide what damages can be recovered by a Florida accident victim. There are also laws for who can collect what kind of damages; for example, if there is a fatal accident then Florida Wrongful Death laws explain who files the claim and which family members are allowed to collect wrongful death damages. How can you collect more car accident damages than the insurance policy limits? What damages can you collect for a concussion in a Florida car accident? In past years, there was criminal abuse of the insurance system. Lots of fake claims were filed in Florida over slip-and-fall accidents. As a result, the Florida legislature has passed laws to try and stop rampant slip and fall accident fraud. For many accident victims, who are already dealing with so much as they recover from their injuries, this can mean a difficult hurdle to jump. Why? Because in the effort to make sure that criminals aren’t taking advantage of the system, the law has increased the burden on the legitimate slip and fall victim to prove their case. The burden of proof placed upon the Florida accident victim is higher now. It’s also higher than it is in other states, which can surprise victims who are new to Florida. Under Florida law, the victim must prove the actual knowledge of the business at the time of the accident. This can be very hard to do – proving with documents and testimony what a business really and truly knew at that moment in time. Did the Business Owner Act Reasonably? In Florida, legislation has been passed which places a bigger burden on the accident victim to get their damages covered in an accident. Premises liability claims particularly must have evidence presented by the person who was hurt that the business owner failed to act in a reasonable manner at the time of the accident. It’s not the burden of the business to do so – it’s yours, as you settle the claim with the adjuster. Your settlement demand letter must include documentation to support your argument that the business was not acting reasonably at the time you were hurt. How do you do this? We’ve delved into all sorts of scenarios, discussing areas where a business may fail to act reasonably in an accident and be liable for their harm. Wet floors in a restroom, weakened railings on a stairwell, even failing brake lights can all be evidence of unreasonable business practices under Florida law. How Do You Know If A Business or Property Owner Acted Reasonably In Trying To Prevent A Stairway Slip and Fall Accident? How Do You Know If A Driver Acted Reasonably In Trying To Avoid A Rear End Car Accident? How Do You Know If A Business Acted Reasonably In Trying To Prevent a Parking Lot Slip and Fall Accident? How Do You Know If A Driver Acted Reasonably In Trying To Prevent a Pedestrian Accident? Car crashes and motor vehicle accident claims are perhaps the most common type of claim that an insurance adjuster deals with here in Florida. If you are settling your accident claim, then we hope that this car crash is the only time that you will ever be involved in an auto accident and suffer injuries. However, while this may be your own time to deal with the aftermath of an auto accident, remember that the insurance adjuster is a professional expert in these things. He or she will have made assumptions about your accident long before you start to negotiations. The adjuster will compare your claim with the thousands he or she has seen before, and use that information to try and keep from paying you anything over his past averages regardless of how unique your situation may be. It will be your job in negotiation to make sure that the adjuster understands and respects why your claim is unique and not something for a cookie-cutter approach. For instance, not all rear end accidents are alike, although there is the presumption that the rear car driver is responsible for the crash. Another example: distracted driving. It is very hard to prove that the driver who caused the accident was distracted at the time of the crash. The adjuster may not be interested in doing the leg work to find out if the driver was in fact on their phone or eating a cheeseburger when the crash occurred. It will be your job to document these facts as part of your demand and settlement negotiation. An experienced Florida personal injury lawyer deals with insurance adjusters all of the time; they know how they operate. They know how adjusters respond to claims and know which adjusters are more prone to deal fairly, while others tend toward gamesmanship. Notwithstanding these facts, this article was written to help fight against abusive adjusters and to help level the playing field for those who want to settle their case without a lawyer. If you or a loved one has been injured in an accident in Florida and you have questions about dealing with an insurance adjuster, a good piece of advice is to speak with an experienced Florida personal injury lawyer to learn about some of the issues that can arise, including how most insurance companies respond to these claims and the type and amount of damages you can recover. Most personal injury lawyers, like Alan Sackrin, will offer a free initial consultation (over the phone or in person, whichever you prefer) to answer your questions.